Right about now, that holiday meal prep fear starts to settle in. You've invited your friends and family to Thanksgiving, but now the realization that you have to cook a very large piece of poultry — and perhaps a dozen other dishes — is beginning to keep you up at night. Whether you're hosting Thanksgiving for the very first time, or you’ve completed the gauntlet before, it's never too late to learn a new tip or trick when it comes to cooking turkey. TODAY Food caught up with experts at Butterball to get the truth about what it really takes to make the best bird. I’ve made a big Thanksgiving meal several times now and I’ve gotten it down to a manageable production. But there is always some element that causes me to break out into a cold sweat each year. This year, I wanted to be extra prepared, so I attended Butterball University, which was led by the very same folks who man the company's famous Turkey Talk-Line each year. Here are seven top tips and tricks I learned that will help simplify and perfect your holiday cooking routine. 1. Set an alarm for Friday, Nov. 17. Here’s the ugly truth: It can take up to a week for a very large turkey to defrost. Not defrosting the bird in advance is one of the biggest blunders that novices make. In fact, Butterball says thawing inquiries are the most asked hotline questions. It takes a shocking amount of time to defrost a turkey. Butterball recommends one day for every four pounds of poultry. 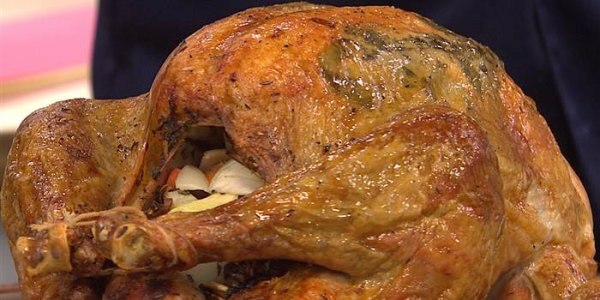 So, if you have a 20-pound bird, that’s five whole days of thawing time, which means you can put your turkey in the fridge on Nov. 17. A smaller bird (think 10 pounds or less) should start thawing on Monday. Once the turkey is completely defrosted, you have three days to cook it. You can calculate how long it will take to thaw your turkey here. 2. Make a foil coil. Last year I looked for my roasting pan rack on Thanksgiving morning to no avail. I just put the bird in the pan and let it roast. But what I should have done was make a “coil of foil.” The reason why a rack is important is that it elevates the turkey, allowing air to circulate for more even cooking. Christopher Clem, a Butterball Turkey Talk-Line expert, told me that lifting the turkey up also "exposes more of the surface area for drippings to collect.” The turkey drippings, which can be used for a succulent gravy later, will also be a richer brown color when they’re allowed to collect under the bird, instead of just around it. If you can’t find your rack or don’t own one, simply take a piece of aluminum foil (a 4-inch wide piece will do), roll it lengthwise and then wind it into a coil. Depending on the size of your turkey, you’ll likely need to place two or three homemade coils under your turkey. This is also one of Katie Lee's favorite Thanksgiving hacks. 3. Do the right wing tuck. So you’ve carefully removed the giblets from your turkey and placed it into your roasting pan. Think you're ready to roast? Think again. Don't forget about those pesky wings, which can splay out and make your bird a little wobbly. The trick to stabilizing a turkey is to take those wings and tuck them tightly under the bird. And if you’re one of those folks who likes to stuff their bird, the wing tuck will also help keep the stuffing secure. 4. Skip basting the bird and get under the skin. The Butterball team was very clear that basting is a waste of time. Basically, whatever you put on the skin of the bird is just going to roll off because the skin acts “like a rain coat,” according to Clem. That means that your pan drippings might be delicious, but the actual turkey meat doesn’t get the benefit of the butter or broth that you’re using to baste. If you want to put your own personal spin on a turkey, the smartest thing to do is get between the turkey breast and the skin and smear it with some herbed butter. Take a stick of butter, soften it and then combine with chopped fresh herbs, like sage and thyme. Then use your hands and rub the mixture directly onto the turkey, under the skin. If you have time, the Butterball team suggests taking the herbed butter, putting it on waxed paper and freezing it. Then you can simply cut it into little pieces and stick those under the skin. Use the end of a wooden spoon to distribute the pieces evenly, which is less messy than spreading it with your hands. 5. Carve the breast off the turkey. If the defrosting and cooking process didn’t throw you off, just wait until you have to slice into that 20-pounder. “Carving is another terrifying moment for new cooks,” Clem said. It can be a stress-inducing moment for sure, especially if you don’t have the right tools. When shopping for a carving set, find one that includes a long, thin knife that is designed to slice through meat, plus a two-pronged fork to steady the turkey while you carve it. If you don’t have a carving set or don't want to buy one, Clem suggests grabbing the “thinnest, longest blade you have” and pairing that with a large fork — or even a wadded-up paper towel to protect your hand. Before you dive in, make sure your turkey is steady. To steady a bird, place a damp kitchen towel under your cutting board. And unlike all the Thanksgiving movies and commercials that you’ve seen, you will not begin by slicing down into the turkey breast. Why? “The fibers in the muscle run parallel to the body, so you get long ropes of muscle fiber” when you carve it that way, says Clem. Instead, carve off the entire breast and then slice it against the grain (end to end) to ensure that the meat is tender and not tough. So your beautiful, golden bird is perfectly cooked ... but then you receive a text from your brother that he’s stuck in traffic and will be late. No problem! Simply cover the entire turkey with foil and then place a clean kitchen towel on top. These layers work as insulation and the Butterball team ensures me that this method will keep your turkey hot (but not overcook it) for 45 minutes to an hour. In the meantime, that gives you plenty of time to bake off a pre-made pie or make gravy. By the time I’ve cooked the turkey and let it rest for 20 minutes, my crew is generally champing at the bit to sit down and eat already, which leads me to skip making gravy. It’s totally cool if you’re ready to have a glass of Pinot at this point, but if you do want to make the gravy, it will be worth the effort: here is how Clem recommends you do it. Pour all the turkey drippings into a heatproof pan and wait for 15 minutes for the fat to rise to the top. Remove the fat (saving 1 to 2 tablespoons) with a large spoon and discard. Add ¼ cup of all-purpose flour to the pan with the drippings, plus the reserved turkey fat, 1 or 2 cups of water and bring to a boil for 5 minutes. Easy peasy and delicious! And if you do encounter some last minute glitches, you can always give Clem and his Butterball buddies a call at 1-800-BUTTERBALL. Frances Largeman-Roth, RDN, is a nutrition expert, writer, mom of three and best-selling author. Her books include "Feed the Belly," "The CarbLovers Diet" and "Eating in Color." Follow her @FrancesLRothRD or learn more on her website.